FOR IMMEDIATE RELEASE – 6.6.18. FC Wisconsin is thrilled to announce the hiring of former English professional footballer Neil Tolson to its coaching staff. Neil will join the club with immediate effect and has been hired on a full-time basis to work with all age groups across all programs. Tolson will join the staff after having a playing career unmatched by any other coach in the Midwest. Tolson played in the first ever year of the English Premier league in the 1992-1993 season with Oldham Athletic and helped them narrowly avoid relegation to remain in the top flight. Tolson would go on to play for Bradford City, York City, Southend United, and Chester City among others. 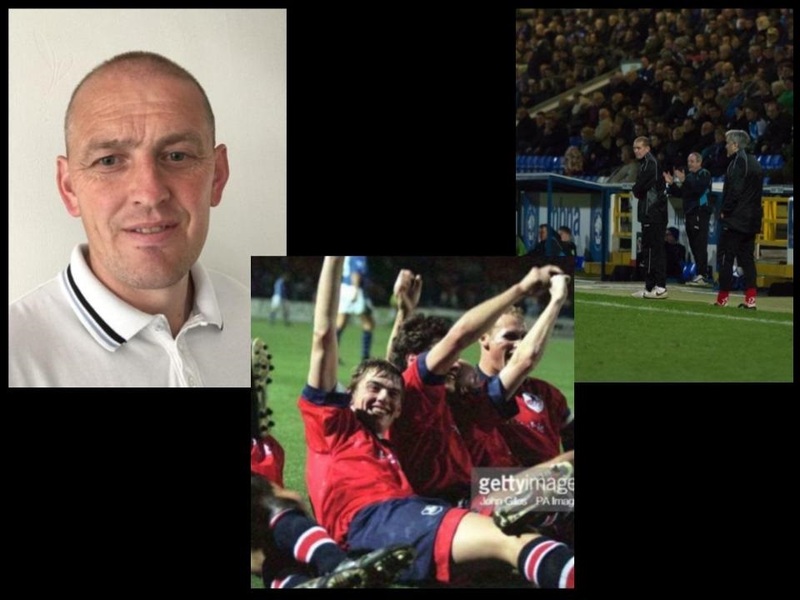 He would achieve promotion to the championship through the playoffs with Bradford City, and scored the winning goal in a 3-2 win over Everton in the League Cup for York City in the 1996-1997 season. Tolson would go on to play over 300 professional games within the English Football League scoring 92 goals in the process. After finishing his playing career Neil would undertake his English Football Association (F.A.) coaching badges and currently is on track to complete his UEFA A License which Is the 2nd highest coaching qualification in professional soccer worldwide. Tolson has been the Manager (Head Coach) of professional clubs such as Hyde United, Stalybridge Celtic FC, and Altrincham Town where he was serving as their Head Youth Director until he accepted his position with FC Wisconsin. “From when we took this club over five years ago, I don’t think we would have ever envisioned being able to make a hire of this magnitude. Not only is this an exceptional hire for FC Wisconsin but also the state of Wisconsin in general. To be able to entice a coach with the background that Neil has will greatly impact so many young players within this area. Neil has played at the highest level possible within the most coveted professional league in the world and we are absolutely thrilled to have him as a part of the FC Family. The knowledge and expertize that he will bring to our club will continue to help push our players to play at the highest levels possible,” said Co-DOC Ben Shepherd. Tolson has helped produce countless players that have gone on to play professionally within England. The most notable being Duncan Whattmore who currently plays for Sunderland and has captained the England National Team at the U21 level. “After being involved in professional football in England for over 25 years, I’m looking forward to an exciting new challenge with a forward thinking soccer club. Both Billy and Ben are a huge reason why I have joined the club. Their philosophy and ambition to continually improve players made my decision very easy. The collaborative coaching model that FC Wisconsin has in place was also a big draw for me, as I enjoy working in an environment with like-minded coaches who want what’s best for their players. Hopefully, my coaching and playing experience can help add to the already excellent coaching staff in place at the club. FC Wisconsin is a club leading the way in player development and I am delighted be a part of it,” shared Coach Tolson. “This is by far one of the biggest hires in the state of Wisconsin. Neil is the perfect fit for our staff and players. He will not only help the players develop, he will also help the club and coaches. His knowledge of the game, his style of coaching, his ability to push yet connect with players, and his ability to help raise the entire program is beyond exciting. We already have an excellent staff. With seven coaches who have either coached or are currently coaching within the college game, there is over 50 years of college coaching experience within our club. However, this hire now gives us someone with the highest experience possible having played in the English Premier League and coached at the professional level, which no other club in the state has to offer. For Neil to have done his research and to choose our club to be with is a massive honor. We can’t wait for him to get started! Welcome to the FC Family,” said Co-DOC Billy Solberg.